Does Someone Need A Power Squadron Refresher? A couple of recent marine accidents make me wonder if some of the professionals need to take a Power and Sail Squadron refresher course. Perhaps navigation? In the first case a professional pilot working in San Francisco Bay crashed an empty oil tanker into the San Francisco-Oakland Bay Bridge. Apparently the damage was ‘relatively’ minor, but it is still somewhere north of $500,000. The pilot in question has had a few more ‘oops’ events in the last few years. Looks like he could use a navigation refresher. Here are some details. The second more serious accident happened in New York City as one of the commuter ferries rammed into the dock injuring at least 57 people, 11 of them seriously. There may be some extenuating circumstances, but it still would be good for them to take a refresher. Here is a link to more information. Taking a course with the Parry Sound Power and Sail Squadron is a great way to learn important navigation and boat handling skills from experienced boaters and sailors. Here’s a link to more for more information. 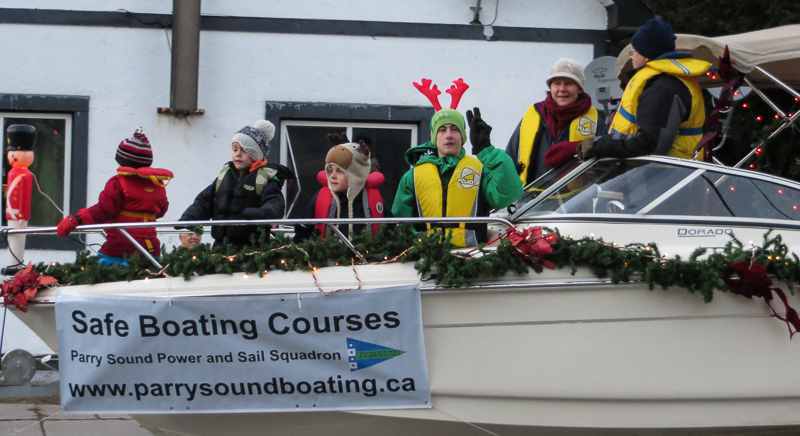 Parry Sound Power and Sail Squadron and Sail Parry Sound successfully launched their jointly sponsored float in the Parry Sound Santa Claus parade this past Saturday. 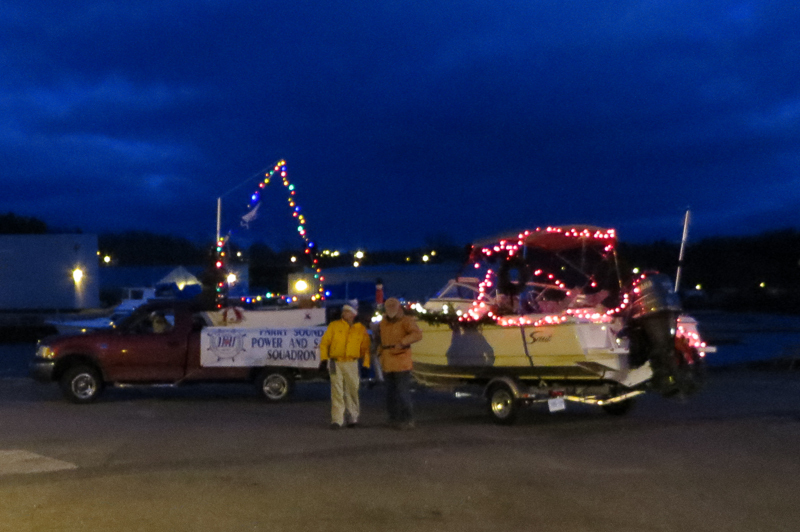 Thanks to the participation of a few dedicated members the float featured an Optimus class sailboat rigged with lights in the bed of a pickup truck. 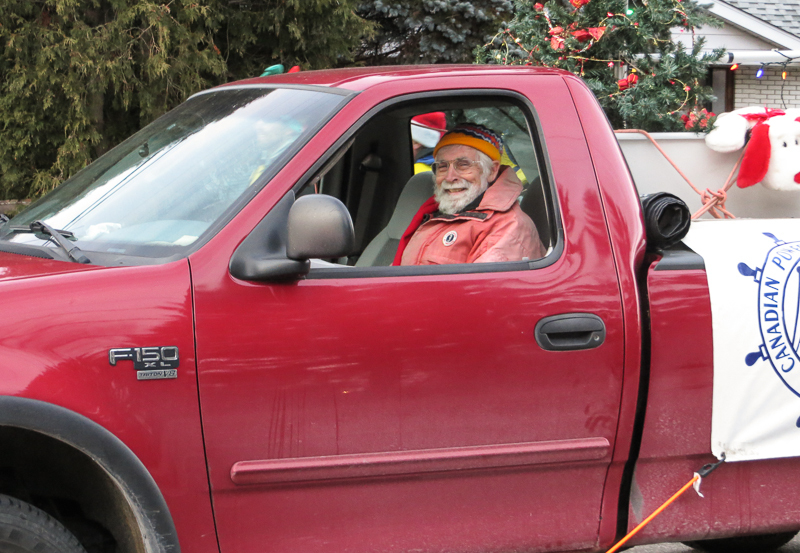 This was followed by a 21′ Scout dressed in garland and lights, carrying a crew of all ‘nice’ kids, and possibly ‘naughty’ supervising adults. All were properly equipped with life vests. The foot patrol of men and dog, similarly equipped with life vests, handed out safe boating course leaflets and mints. You had to be there to have fully enjoyed it. Interested? We look forward to your participation next year. Here are a few photos from the parade. Happy holidays and safe boating. 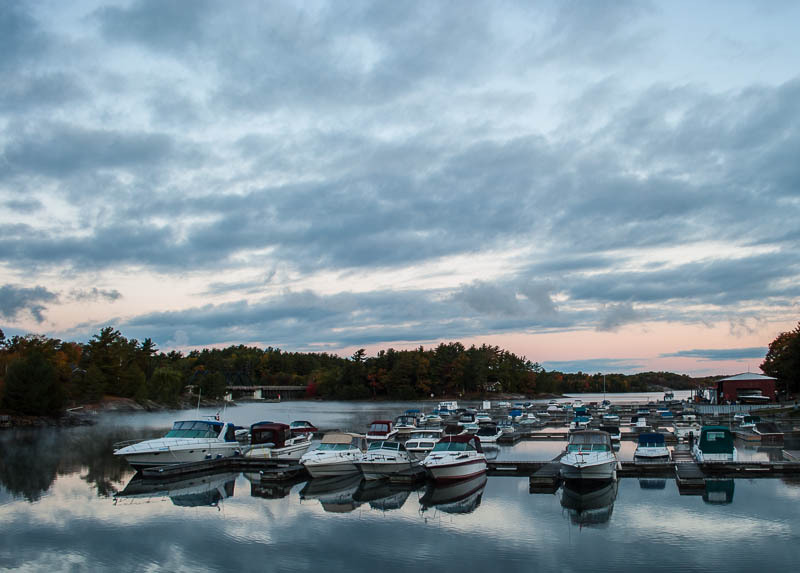 For information about upcoming boating courses please head to http://www.parrysoundboating.com. White Squall – A Reprise? Those of you who attended the Squadron’s movie series last winter will remember the movie – White Squall. It concerned the unexpected and tragic sinking of the brigantine style training ship The Albatross. A short summary of the movie and the real life story can be found at the earlier post. This movie is brought to mind by the similarly tragic sinking of the HMS Bounty as it crossed the path of Hurricane Sandy. The cause of the sinking is easily understood, a hurricane, rather than a mystery, as it was with a presumed white squall that hit The Albatross. 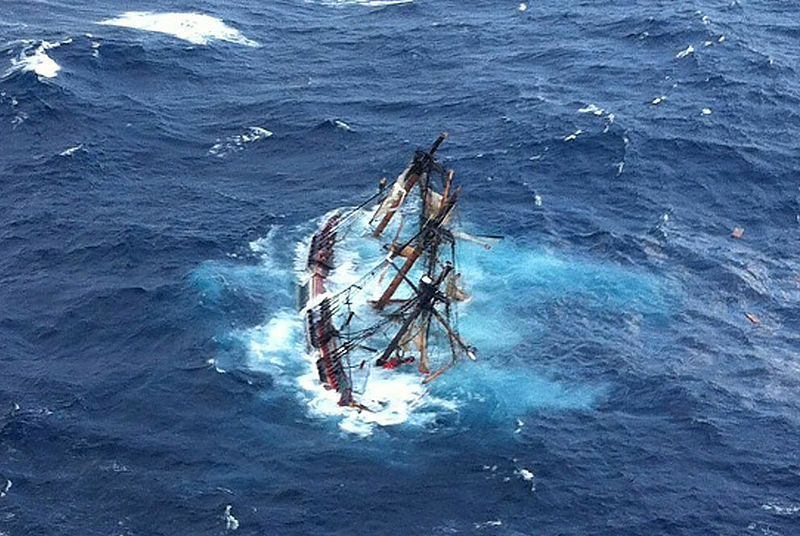 Fortunately the crew of the HMS Bounty saw what was coming and were better prepared. There is only one reported death, although it seems the captain who is missing, most likely has perished. Even survival suits and life jackets can only provide a limited amount of protection when we move into late October temperatures. This type of accident is not supposed to happen, but it does much too often. That’s why we need to know how to operate our boats, why we need to carry at least the legally mandated safety equipment, and why we should always have a rehearsed plan for handling an on-water accident/disaster. It’s time to think about getting the knowledge you need to operate your boat safely. That means much more than just having ‘The Card’. 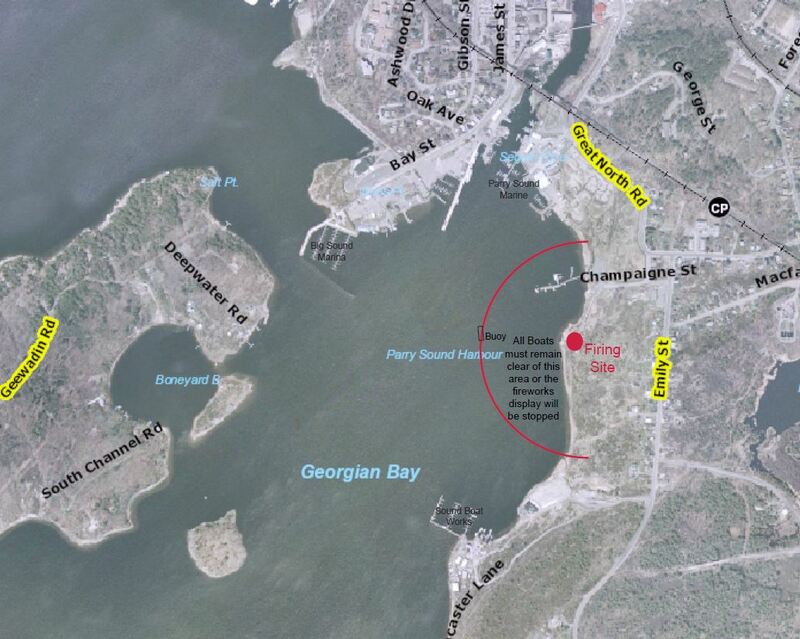 We’ll soon be posting information on the courses that will be offered by the Parry Sound Power and Sail Squadron in 2013. Register, learn to boat more safely, and have fun out on the water. The film, “Scott of the Antarctic” has been advanced one week to avoid conflict with the Grey Cup game. It’s now November 18th. Details are provided below. Your host is Steven Duff. The date and time for this is now Sunday, November 18th, from 1:00 to 4:00 in the Lions’ Room at the Museum on Tower Hill. Admission is $6.00 for adults and $4.00 for seniors and students. And, yes, we’ll have warm drinks and snacks – you’ll want them after you see this! 2012 has been a year of various anniversaries and centenaries, covering the good, the bad, and the ugly. One event from 1912 that has had little air-play is the tragedy of the Antarctic expedition led by Capt. Robert Falcon Scott. We’re making amends at the Museum with a tribute to Capt. Scott, his men, and their terrible encounter with Murphy’s Law. A display and a historical introduction are planned and the main part of the event will be a screening of the classic 1952 film Scott of the Antarctic, starring John Mills and featuring a sound-track by Ralph Vaughan Williams that ranks as one of the greatest ever. Do We Have A Tide or What? I’m betting on what. It’s not always easy to see how low the water has dropped in the last month; floating docks can disguise the difference. This shot clearly shows the drop. While it is a common seasonal event the drop in water levels still is disturbing for those of us who depend on another foot of water to stay out of trouble. Coming soon, a new adventure from our favourite sailor. It promises to be a tale of challenge and lessons remembered – The Old Man and the Sound. Check back this weekend. 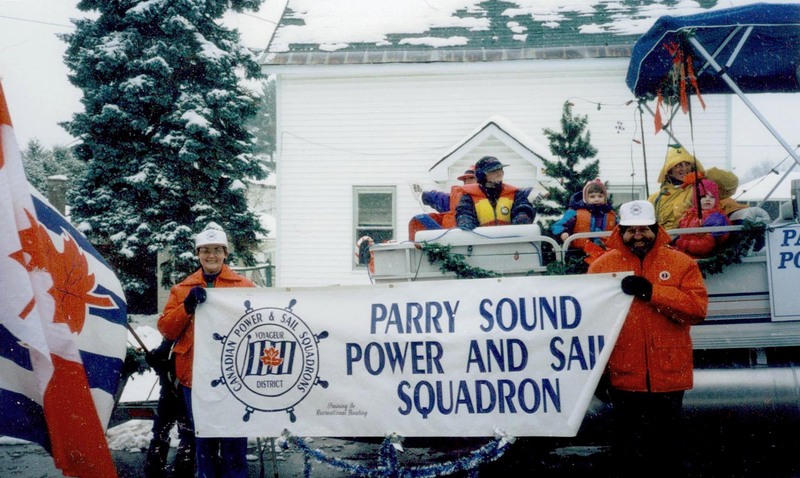 The Parry Sound Power and Sail Squadron will be participating in the Parry Sound Optimist Club’s Santa Claus Parade. It is scheduled for November 24th, starting at 16:30. The theme will of course be boat safety. Want to help? Have some ideas on helping the Squadron make a big ‘splash’? 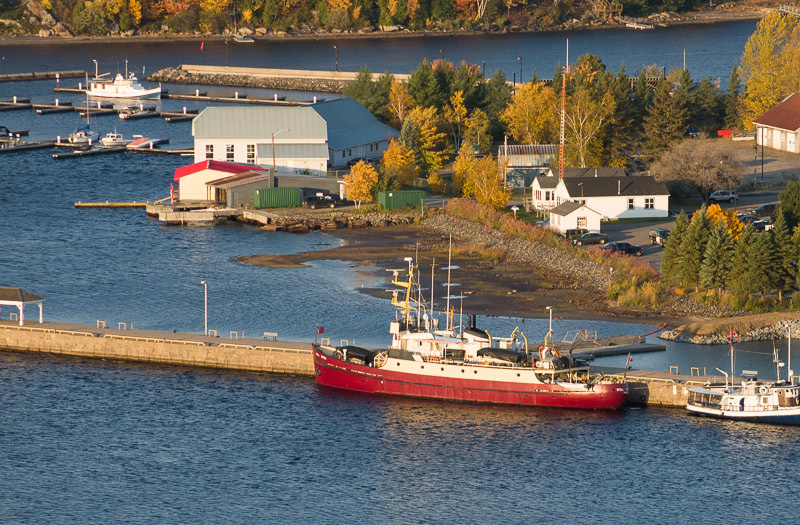 Drop a line to either secretary@parrysoundsquadron.ca or communications@parrysoundsquadron.ca. Here’s a reminder of what the Squadron’s last entry in the Santa Claus parade looked like. It seems to be something from another century. The Squadron is saddened by the recent death of our immediate Past Commander: Hans-Hubert Latzel, MD. Those of you who didn’t know Hubert, and those who did, will enjoy the very brief overview of his life provided by another Past Commander of the Parry Sound Squadron, Marianne King-Wilson. Past Commander Hubert Latzel died a few days ago. He was found aboard his houseboat-cruiser, Whiskey Jack, where he lived each summer. 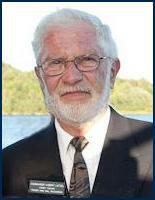 Hubert described himself as “addicted to Georgian Bay”. These were his home waters, and he knew the area well. An accomplished photographer, he focused on nature. Whether the smallest patch of moss or mushroom, or the watersnake beside his boat, or the birds at his feeder, Hubert turned his lens to their beauty. Hubert was a keen observer of the world, science and politics; his blogs were an analytical and eclectic reflection of the thoughtful, outspoken person he was. A willing volunteer, Hubert was always eager to help at a Squadron function, and joined the Bridge within a few years of completing Boating. He was generous with his time. First he served as Membership officer and then moved to Exec, and Commander. He told the members he was honoured to be the Commander during the Fiftieth Anniversary of the Squadron, with so many celebratory events. 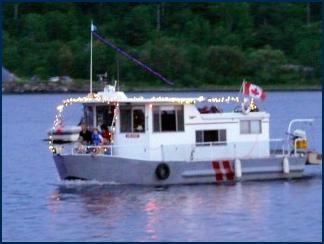 He never missed a Canada Day Sailpast. It held special meaning for him, as “a newbie Canadian” as he called himself. At the 2012 sailpast, flags were lowered on all boats in tribute to Hubert. Hubert came from an ancient Austrian family of entrepreneurs who had started a school for weavers, later introduced the first modern kiln for quicklime, and then developed the sugar beet industry, with three agricultural schools to educate farmers. Despite the ravages of wars, one of the schools is still operating. He pined for the woods and the animals and fresh air, and so eventually returned to a Jesuit school in Austria and a high school which taught natural science. He graduated in Medicine from University of Muenster, Germany. As a respected physician, he practised the healing profession for many years before his early retirement and move to Canada, where his son Markus had just started a family with his wife Marilyn. Hubert easily took up the role of grandfather with a wealth of knowledge about nature and science to share with his granddaughters Maya and Marissa. They spent happy days together exploring his favourite islands aboard Whiskey Jack. Hubert passed the family gift for entrepreneurship to his sons Markus and Edrik, who now run successful businesses in Canada and Germany, following their own passions. Hubert’s kindliness and generosity of spirit will be greatly missed by his family and friends. Funeral arrangements entrusted to Torrance will be announced in due course. Hubert once said that in his next life he wanted to be a bird. Now is that time, soaring free over the Bay, with a transcendent vista that can only be imagined. Communications Officer note: Hubert’s heartfelt pictorial overview of The Snakes can be found through this link. With time, and as his site is inevitably retired and lost to the public, we will will host a copy at our site. In the meantime take the opportunity to peek through the eyes of another human being. Can’t Find Your Boating License? About this time of year boaters find they can’t locate their Pleasure Craft Operators Card (PCOC). We can’t help you but here are three suggestions to get you on the water legally. 2. If you earned the card from another group, call them. We’re sorry but we don’t have any numbers for you. A quick search online using the name of the organization should get you pointed in the right direction. We hope this helps; safe boating to all.